So I've been a bit slow on posting more thoughts about the 2007 Horizon Report. But I'm getting back into looking at this document as Wayne and I are planning a course--"Emory Horizons: [insert explanatory phrase here]"--for next February for members of the Emory community to discuss how we see our campus reacting to these technologies that are on the horizon. In the spirit of Web 2.0.0.7, we're making some of these planning documents available for others to read. Of course, you say, if we are teaching in 2008, won't we be a bit behind the curve? What about the 2008 Horizons? Good point. So we're dropping and rolling and getting geared up for the technologies that will be in the new report. EDUCAUSE et al have been working for most of the year on the new report, and we can already see the short list of twelve technologies that will shortly be narrowed down to the final six. All of 2007's six trends are still in the running, but others that I think are more important to highlight have been added (online collaboration and online mapping, in particular). You can also peruse the resources the authors of the upcoming report have found at del.icio.us using the tag "hz08." So the point is that Emory will be one of the first campuses in the nation to offer up a response to the upcoming report. Become a part of it. Oh. Did I mention that in ECIT I'm supposed to learn Photoshop too? Now I swear I'm not the ECIT Woodruff Fellow in Applied Googletechtonics or anything like that. If I was, perhaps my stipend would be a bit larger. Be this as it may, I have another G-related observation. In addition to planning the upcoming Emory Horizons event, I have also been experimenting with making my own Google Map. Why would you want to do this? Well in my case, I figured it would be an easy way to represent my job search. I can get a general idea of where the jobs are at and refer to it when I have to make those tough choices between Tufts, Rutgers, and Westminster. This is also an easy way to share this information with my family and, eventually, to start thinking geospatially about my future. This is actually really easy to do. All you have to do is to be logged in to a Google account, and go to their maps page. Click on the "My Maps" tab partway down the page, and you can start adding place markers, drawing lines, and/or shapes on your map. You can then get a URL or the code to embed the map. Of course, you can make the map public or private. Or as KML for use in Google Earth. More and more, I think that geospatial information is going to become more and more a part of everything we do. And this is an easy way to get a start mapping your own experiences. I have also found out how to add images (click on "Men Without Women") and links (click on "Nobel Prize in Literature") to the descriptions. The latter took a little bit of coding, but nothing obscene. I think it would be easy to hand the students a list of basic commands to accomplish making their own links. What is making this timeline work so much better than my first one is it is being powered by the SIMILE Project's Exhibit software. This software is--to borrow a term from our TLC conversations--allows you to make mashups of information by building a database and linking objects together in whatever relationships you want. It also provides a good way to filter this information. They have numerous examples: billionaires in history, US Presidents, and cereal mascots. You'll notice that the first two use geotagging (as well as Google Maps) to produce their results. A less visually stunning, but perhaps more useful example is this conference schedule which someone built within Exhibit. The filtering seems really useful (as well as the ability to search on any field). You can also view the conference as abstracts and as a Timeline. This is because Timeline is a component you can add into your Exhibit. And Exhibit, fortunately, allows you to take feeds from Google Spreadsheets. There are still a few things that I would like to work out on this timeline. At the moment, I can only use years with events; months and dates don't display accurately. I would also like to have the ability to have events show up in different colors based on the "type" of event they are, something I have specified in the spreadsheet. So I have some questions out to the folks at MIT, and we'll see what they come back with. At the very least, however, this means that I could run a spreadsheet in my classroom without too much work on the part of the students. Good times. I was playing around very quickly yesterday with my Picasa Web albums and noticed a new feature. But wait, let's back up. Picasa is Google's photo editing software. In the grand Google tradition, it was the product of a company that Google bought out a few years ago. I've been using Picasa for over two years and I've found it's a very nice tool for keeping all of my photos and movies organized on the computer. When you have children, you quickly realize that you need a tool for organizing almost as much as you need one for editing. Another thing that I really love about Picasa is how it integrates with Gmail. You can bundle photos to send out to people straight from the photo software. Again, you can do that with many other programs, but what was essential for me was that Picasa automatically resized the photos for me when I mailed them out. Since we have an 8 MP Canon camera and we didn't have broadband at home until about six months ago, this meant that sending photos could be a real pain. Picasa took care of all that for us. This isn't so much of a problem on our end anymore, but it is still nice to use the software to prevent our sending out those massive, 8x bigger than your screen photos. Okay, so we've covered Picasa as it functions on your computer. About two years ago, Google also created a web presence for Picasa that allows you to host photos online and share them with others. Of course, there are a lot of other services that allow you to do this as well: Kodak Gallery, Photobucket, and, of course, Flickr. These tools are great for sharing photos with others (because--at least with Flickr and Picasa--you get an RSS feed of people's photos and can then read them in your feed reader of choice [see previous blog post]). And of course, they allow you to tag your photos, use each photo's individual URL for hosting it in a blog or some such thing, and more. Another new thing that at least Flickr and Picasa have included is the ability to geotag your photos. What this means is that you can identify where a particular photo album was taken and then drag and drop those photos onto a map to give an even more precise idea. You can see how this works in Flickr (photos geotagged to "Amsterdam, Noord Holland") and in Picasa (an example of photos mapped along the Strip in Vegas). I'm not as familiar with Flickr as I am with Google's tools, but I have to say that I like the latter a little better because it gives better outlines of buildings. So this brings us to last point (which is really where I started). If you are looking at a Picasa web album that has been geotagged (like this one of photos I took during the Dragon Con parade), then you also get the option (in the right hand corner) to view the photos within Google Earth. When you click on this, you can either run it immediately in Google Earth or download the kml file. And suddenly you have your photos plugged into Google Earth for you. Magic! Now of course, you can insert photos directly into Google Earth without too much trouble. But if you are already using Picasa Web, this will save you some time. Even if you aren't using it, however, this might be an easier way for people to get photos into Google Earth than having to deal with the coding that is otherwise required. So it occurred to me this morning that I perhaps should have used my Piping powers for good and not for idle entertainment. As such, I've created this Pipe that parses several academic blogs for content relating to the job search. Of course, you can edit the Pipe source and add blogs that you'd prefer to see here. But maybe this will prove useful to those of us who can't seem to get enough information about this madd(en)ing process. So just when you thought you were getting sick of the whole Web 2.0 thing and that you'd seen every possible mashup possible, Yahoo! comes up with a new tool--Pipes--to help you mash all by yourself (no servers or complex coding required). It's basically a visual tool for taking various information (RSS feeds, CSV documents, geolocators and more) and joining, filtering, and/or combining them to produce a specific output that you want. So what can you mash together? Well, the first thing I did was to take news feeds from CNN and Google, combined them together and put them through a filter to pull up everything on the search terms "Tibet," "Tibetan," and "Dalai." (You can tell what's going on at Emory at the moment.) You can see the result here. You could then use this page for a continual update on this subject--or you could use the page's RSS feed in your reader of choice and get the particular news items delivered to you. No more searching through Google or CNN for the particular stories you're interested in (as long, of course, as you know the search terms that will likely appear in the story). You can see also the representation of the pipe in the lower right corner of the page, and if you have a Yahoo! log-in, you can edit the pipe itself to adapt my work and make it more suitable for your own. But wait! There's so much more. I then decided to take the Emory news feed, filter it to only bring me news related to Tibet and the Dalai Lama and rolled this together with photos on Flickr that are of Emory University and have tags that relate to the same search terms. The results are here. What's new with this pipe is that it also returns a map. One of the photos has been mapped to a particular location within Flickr by the photographer, and Pipes automatically incorporates this information. If you click "Links" about the map, you will see the results: as of today, there are two hits from Emory News and two photos from Flickr. You can again edit the pipe yourself. I then wanted to create a crazier looking pipe with more variables. The result was taking the news feed from Emory and using all the photos from Flickr that relate to Emory (not just ones with Tibet related tags). You can see the results and edit the pipe, as always. But there are a lot more tools within Pipes. Say you want to read the sports from Le Monde, but your French is just not where it was back when you had to, say, pass a Ph.D. translation exam. You can get the feed from their sports page, run it through a translation loop, and get the results. It might not be perfect, but it's a sight better than my own translation. Other functions within Pipes allow you to map things. I've been trying to figure out if I could use Pipes to solve my Timeline XML problem, but that has yet to happen. To get more ideas about how to build interesting pipes, you can check out the public gallery and copy their source and fiddle with it. In any case it is a fun service to use and a lot easier than similar things I've tried in the past. It appears that the other big names in the online world (Google, Microsoft, etc.) are developing their own similar tools. But now you can be the first on your block to have piped. I've been busy with TLC in the last few days, so I haven't had a lot of time to be adventuring in ECIT. Today, however, I finally started work on a project I've been interested in for about a year. Again, I'm going to have to give Jason Jones the credit for uncovering the technology: interactive timelines. Jason wrote about his plans to try to use this in a course during Spring 2007 on his blog. Unfortunately he has since restructured his blog (moved domains or something techno-geekish like that). You can, however, still read about Michael Elliott's discovery of Jason's blog post here. In any case, the technology for these timelines has been developed by MIT's SIMILE Project. To steal a bit of their boilerplate, "Timeline is a DHTML-based AJAXy widget for visualizing time-based events. It is like Google Maps for time-based information. [...] Just like Google Maps, Timeline can be used with zero software installation, server-side or client-side. And like Google Maps, you can populate Timeline with data by pointing it to an XML file." So yeah. There's a mouthful. However, the results can be stunning. I've got a couple of different ideas for using timelines like this. You could use them in a survey class to map texts and historical events to put things into context. You could also use them to help you read one particular novel--something with complex chronology like Slaughterhouse-Five or Jazz. Or you might use it to track Emily Dickinson's output. Of course what would make this most is the ability to build the timeline collaboratively among class members. There's not a whole lot to be gained in my opinion, if you are just asking the students to look at the work you've put into it. Instead, you want to help them start mapping (chronologically, of course) the subject of the class. And if you go the extra mile, you can use the timeline as a discussion tool. For example, if you look at the timeline for JFK's assassination and click on an event, you will notice in the lower-right corner that there is a "discuss" link. This link takes you to a wiki page devoted to that event. Linking your timeline to a wiki could allow students to discuss when an event should be situated. Look at all this technology converging! Whee! Of course, the difficulty is getting your timeline up and running. And let me tell you that so far it has not been a picnic. The "basics" that MIT provides on the timelines are not really all that basic (or legible). The "how to" for creating timelines is not much easier and assumes that you already have a decent grasp of writing HTML. After spending several hours with the how-to page, however, I and my trusty pal Dreamweaver were able to create a VERY simple timeline. The difficulty in making the timeline, as I'm discovering is entering the events. This has to be done in an XML format. You can see mine here. Timelines with more data understandably require much more coding (as you can see with the JFK timeline's XML). Still, the coding and the formatting is not that difficult. The problem as I see it currently is that I want my students to be able to work collaboratively and on the fly with the data. As in, Suzy Q logs in to *insert name of fantasy software here* and can quickly edit fields for "date," "event name," "event description," and maybe some extra fields like "image" or "link." She can immediately hit refresh and see her work on the timeline. At the same time, George X can be working within the same piece of *fantasy software* and be editing his own portion of the timeline or making some changes/corrections to what Suzy has been doing. I could ask the students to just cut and paste my XML formatting and substitute their own language. They could then email the code to me. And I could then upload it to my webdrive or something like that. But that's not what I want to have happen. I want this to be as automated as possible. And there's the stumbling block--for the moment. I have a hunch that Google spreadsheets or perhaps Zoho's database can help me out of the bind. Or perhaps it's Google Calendar that can come to the rescue. We'll have to see. And I'll keep you updated. Today I came across (thanks to Jason Jones) a new suite of online tools for online collaboration. Zoho provides the three big tools that Google Docs does: word processing, spreadsheets, and presentations (aka PowerPoint). However, it has a larger suite of tools including databases, online conferencing, note taking, and wikis. It also offers email clients, chat, and more. In some ways, though, Google is offering--or will be offering soon--many of these same tools, they just aren't necessarily part of Google Docs. One thing that I like about Zoho is that it should play nicely with MS Office. There's a plug-in that allows you to work offline and keep your documents in Zoho up to date with the changes you make on your desktop. Something else is that Zoho's editing features within, say, documents are more robust and advanced than Google's. So if you want a little bit more functionality and interoperability than Zoho might be a good solution. Behold the power of MS Office! One of just many difficulties is the rise of digital communication in the job application process. Rather than simply stuffing everything into an envelope and addressing it to "Chair, Search Committee for Asst. Professor of Media, Culture, and Information Flows (?! )," we now get to email things directly to a person or, more likely, go through each university's individual application process at which point we upload some of our carefully workshopped documents. The electronic application is nice in the sense that we can send things later (a few minutes before a deadline) and that it is more likely that the "letter" will reach its addressee (Derrida notwithstanding). 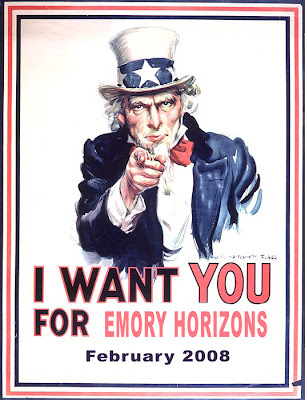 A marked disadvantage of sending an emailed cover letter, however, is that you might lose the chance to make an impression on a potential employer through Emory's letterhead (something we have traditionally picked up from the department office and then printed onto). So today, instead of learning more about social networking, I decided to monkey around with the newest version of Microsoft Office. I've heard a lot of people complain about the interface, particularly of Word, but I find it a lot more intuitive than previous versions of the software. Of course, if you've been using previous iterations it becomes counterintuitive. But I'm getting used to it and love the amount of control that is presented to me on the front page. I like it quite a bit--especially since we students can get the entire Ultimate Office Suite for $60. In any case, coupled with the Office tools and some guidelines from Emory's Office of Brand Management--where was this site in 2004 when I taught my class about branding? They even have documents that tell you which colors coordinate well with Emory blue (see page 15)--I was able to mock up something that looks remarkably like the English Department's letterhead. Start your letter where I indicate, and you're good to go. Just don't mess with the margins and make sure you don't go onto the third page (where the header will show up again [it's on every odd page; this seemed like a nice coercion to make me toe the line on length]). There are slight differences between this and the official, printed-for-us letterhead. I won't bore you with the details (although I could be convinced to bare all in the comments), but I did stick to the published guidelines for stationary. In any case, I hope that this will make it easier for all of us to get jobs. I'm surprised, honestly, that Emory hasn't come up with an interactive letterhead to take care of things like this, but until then we've got this. Feel free to point it out to other departments' students, since it is easily editable. TLC is something that we are hoping we can role out to more of the graduate programs within Emory with a goal, of course, of providing the training in technologies that will be especially appropriate for the various teaching situations in each of the different disciplines. Doing this will hopefully facilitate discussions among the graduate students and faculty attending that will help everyone discover new methods for teaching materials--even if these methods have nothing to do with technology. Some of these goals/ideas are very similar, and I think it's interesting that most of them revolve around the idea of user-created content. These are obviously interesting technologies to people who want to help students take some of the control of their own learning processes. It's also nice to see that ECIT will be able to help people with each of these projects. Mapping? Try Google Earth, which will allow you to customize layers very easily through XML. Wikis and blogging? You can use the new functionality in Blackboard 7.1 or you can find alternate solutions. Photo hosting? Flickr is just one of many options. As always, the key remains knowing when to use a new technology and when to use an older one (pencil, paper, chalk, eraser). But it's exciting to see--even over a year's time from when I was doing TLC--how much easier the tools for accomplishing some of these projects have become.